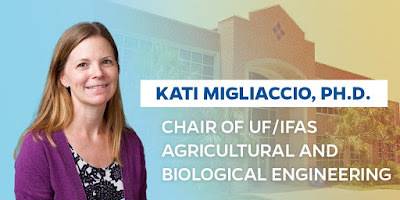 In August, Dr. Kati Migliaccio formally began her term as Chair of UF’s Agricultural and Biological Engineering Department. With new administrators come new ideas and Dr. Migliaccio is very much a researcher of the moment - well-versed in perfecting how engineering and technology can benefit the end-user. 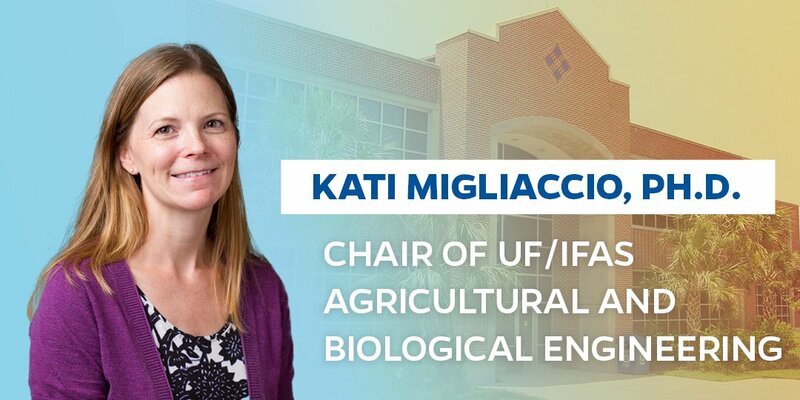 During the recent ASABE meeting in Detroit, Dr. Migliaccio agreed to an interview with IrriGator to discuss water-use research at UF-ABE and other thoughts about where the department is and where it’s going. 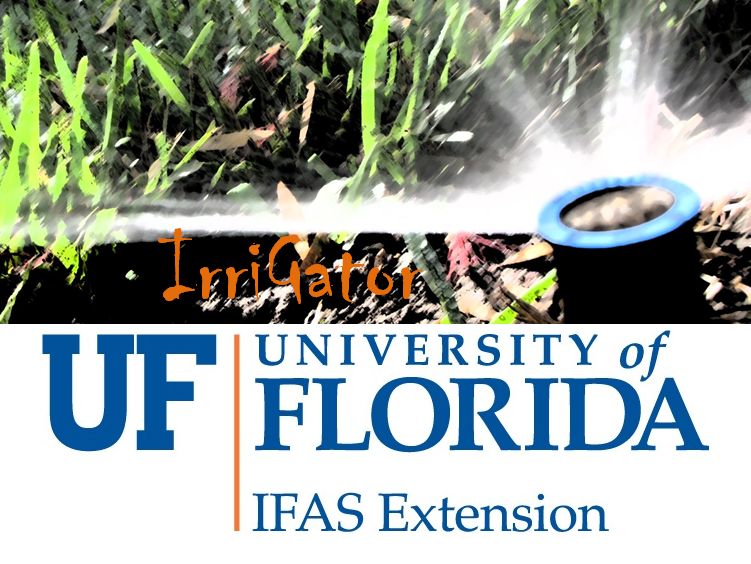 IG: What’s exciting right now in terms of water-use research at UF-ABE? KM: There are several things that are exciting. One is looking at water scarcity and the aspects of how we’re going to manage water for the growing food demand and the growing population, and with sea level rise. There are many factors at play in a dynamic system. Another interesting aspect, related to climate change, is the change in water availability over space and time. Crops that are grown in some places may no longer be grown there; crops may be grown in other places, so the water demands are going to change. How are we going to modify our food systems on small scales and larger scales to adjust with those changes in a sustainable way? Water research is also moving forward with technology. 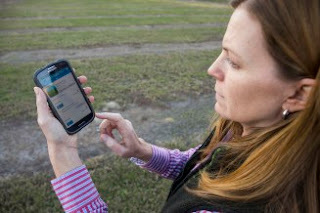 Technology is becoming an integrated part of all water management decisions. Technology is more user-friendly and people are becoming more accustomed to using it. You’re seeing more and more technology applications related to making better water decisions - in restrooms, outdoors in irrigation. With any water application, new technology is developing either in sensing, or managing volume, or allocating our resources so we don’t overuse something for an application that requires a smaller amount to get the job done. IG: Is there some water-related research that may be missing that you would like to see develop further in the department? KM: The one area that I would like to explore more that we haven’t has to do with vertical farming and how we can manage resources - water and energy - to produce our food in a more contained environment in readily accessible places like cities. I see that as a real future focus area for our department. IG: You have always had an interest in the professional development of students. Are there any plans to encourage more of that in the department for undergraduates - more lab and industry experience? KM: One of the really valuable things a student can experience is that partnership with industry. I would like to see us grow those relationships so that students are exposed on a more regular basis to what it would be like to work for different types of companies and do different types of things. And also, give students the experience in the profession environment. So not just applying the knowledge or the fundamental principles they learn in graduate school, but also polishing their professional skills and working in that environment that is driven by many factors and not just the science. IG: What would you say to an incoming undergraduate student with an interest in engineering. Why choose UF-ABE? KM: UF-ABE provides a very unique opportunity for students. We have a fairly good ratio of faculty to students. Students in classes do get to know the faculty and faculty are very helpful to the students. That’s not true in all engineering disciplines, many of which have larger classes. Also the application aspect is something that you may not experience in other disciplines. Because it is agricultural and biological, all of the engineering principles and core operation management principles, are applied to real world situations - water issues, energy issues, and food management system issues. You get that experience of applying concepts that you’re learning to something you can really appreciate because they are part of your life. It’s a great place to be. You learn how to not only solve problems from a technical aspect that you might apply professionally, but also how you can integrate this knowledge in your own personal life to be a better citizen. The future and our ability to live well will depend on our ability to manage our resources. The agricultural and biological engineering discipline focuses on managing our resources. ABE students will contribute to a more sustainable world for future generations - and UF-ABE offers excellent training for students to succeed in this endeavor.